Tag line: "The Hell-Horde they called The Butcher's Battalion! " William Quantrill, a Confederate Captain during the American Civil War whose guerrilla tactics made him one of the conflict’s most notorious figures, has been a character in a number of films over the years, including Raoul Walsh’s Dark Command (Raymond Massey played the infamous leader, whose name was changed slightly to “Cantrell”) and Ang Lee’s Ride With the Devil (in which John Ales appeared briefly as Quantrill). 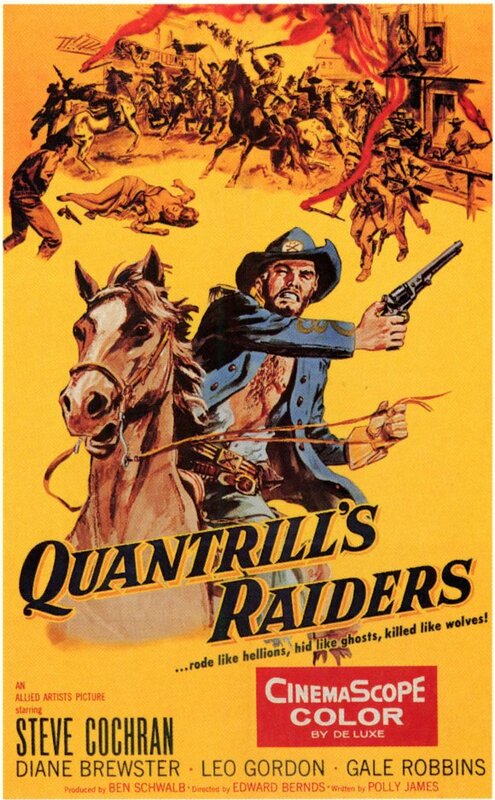 Released in 1958, Quantrill’s Raiders is a fictionalized account of Quantrill’s 1863 raid on Lawrence, Kansas, and while the event as re-created in the film is far from historically accurate, Quantrill himself, played with gusto by Leo Gordon, is simultaneously the most interesting and most frightening individual in the entire movie. Posing as an ex-Union soldier turned horse trader, Alan Westcott (Steve Cochran) is, in reality, a Confederate Captain sent by his superiors to pass along an order to William Quantrill (Gordon): destroy the Union arsenal in the town of Lawrence, Kansas. While his “hit and run” tactics have made him something of a legend in the territory, Quantrill is, as Westcott quickly learns, a ruthless risk taker more interested in looting than in winning the war. And after getting to know the residents of Lawrence, including Sue Walters (Diane Brewster), who runs the local boarding house; and her nephew Joel (Kim Charney), Westcott begins to wonder if Quantrill’s harsh methods are the Confederate’s best option, or if he himself should lead the raid. Not that it matters, though, because whether he’s invited or not, William Quantrill has every intention of being in Lawrence when things go down, and God help anyone standing in his way. Though he plays what amounts to the lead role in Quantrill’s Raiders, Steve Cochran isn’t nearly as effective as Leo Gordon, whose Quantrill is a volatile military leader hell bent on destruction, a man who has no problem ordering the slaughter of innocent women and children, and isn’t above slapping around his best girl Kate (Gale Robbins) when she gets out of line. Despite being the title character, Quantrill is clearly the villain of this 1958 film, and Leo Gordon’s sometimes venomous turn ensures that the audience never once feels anything but contempt for him. Set during the Civil War, Quantrill’s Raiders, with its impressive landscapes and exciting chase scenes (mostly on horseback), is a better western than it is a war movie (the opening battle, where Quantrill and his men ambush a Union patrol, is lackluster at best). But Leo Gordon’s spirited portrayal of Quantrill, coupled with a finale that’s as thrilling as they come, make Quantrill’s Raiders a fine action movie, not to mention an entertaining film overall.